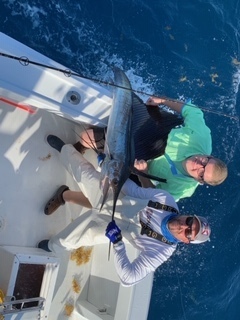 Jim Cochrane and his son, John, from St. Augustine chartered the Top Shot Sportfishing charter boat team for a private deep sea charter boat sport fishing trip in Fort Lauderdale, FL - Captain JB was at the helm. We started trolling the reef line drop off north of Fort Lauderdale searching for an area favorable to do live bait kite fishing. In our search, I stopped by one of our wrecks in 220 ft. of water and put down a live Goggle Eye for bait. In a short time, the rod bent over, and I went ahead with the boat to avoid the fish going into the wreck. After a twenty minute battle, John and Jim fought the fish, which was a 30 lb. Amberjack, and brought it to the side of the boat, where our mate, Russ, put the fish in the boat for picture taking, removed the hook and the Amberjack was released to fight again. We set up again on top of the wreck with the same set up and another Amberjack was caught and released. There was a color change rip forming in 185 ft. of water north of Fort Lauderdale which looked very promising, so I put out two kites with live bait on each of the kites. Everybody was waiting for his appearance – black shadow – right long – bill and dorsal out of the water, as the Sailfish chased the live Goggle Eye bait around until he succeeded – hooked up. The Sailfish came out of the water exposing his beautiful neon colors. After a good battle, the anglers brought the Sailfish to the side of the boat for picture taking. The Sailfish was released to fight another day. Congratulations Jim and John for a job well done.